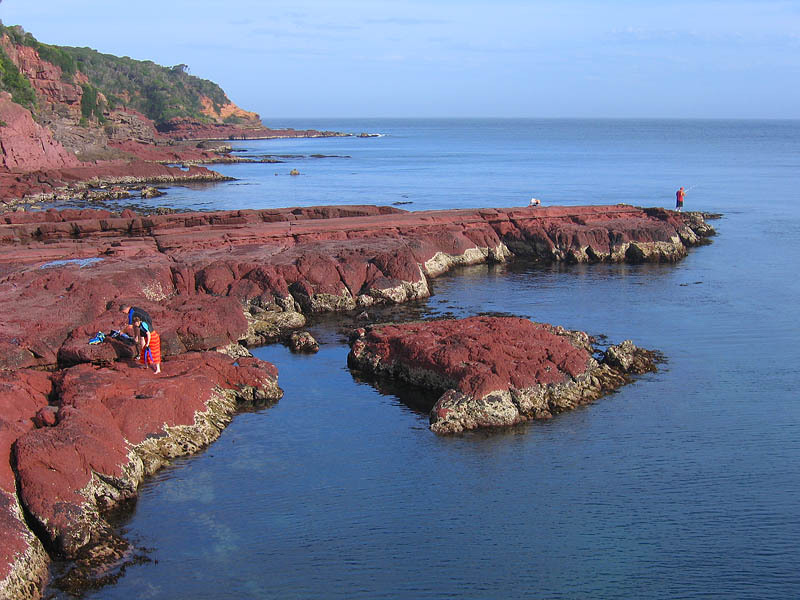 Attractions abound for everyone in the gorgeous seaside resort town of Merimbula, located on the Far South Coast of New South Wales in Australia. With a population around 4000, it's common for this family friendly destination to swell in size to 20,000 during the peak summer holiday season. Accommodation choices are numerous around Merimbula, which include luxury style apartments, units, hotels, motels, cabins and camping grounds. Prices fluctuate widely during the year, with peak period times at Christmas and Easter commanding the higher fees. Bookings are highly recommended in peak times. For more accommodation information, contact the Merimbula Tourist Information Centre, Beach Street, Merimbula, New South Wales 2548 Ph: (02) 6495 1129. Swimming at Merimbula's beaches is relatively safe, with the protected Bar Beach being known as the safest in the area for families. Picnic tables, electric bbq's and toilets are provided at this scenic location. 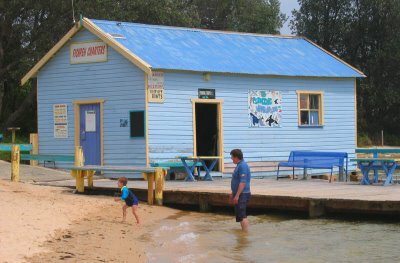 Photographers and artists find the Bar Beach area to be of enormous inspiration, with the spectacular scenery across the lake to Main Beach providing for excellent photography and painting opportunities. 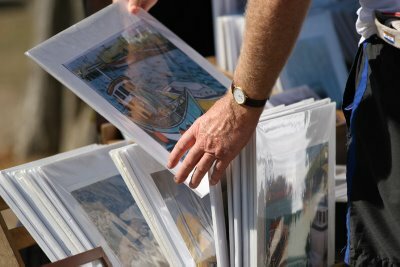 Photography and painting works can be found in the local stores and galleries in and around Merimbula. 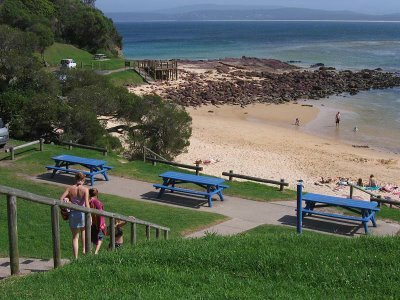 Main Beach is Merimbula's most popular beach, due to its close proximity to accommodation establishments that abound on the area known as The Fishpen. 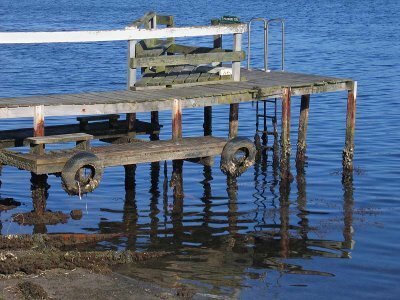 Swimmers, body boarders and windsurfers find this spot ideal, while local and visiting fishermen wet a line here and land regular catches of flathead, whiting, salmon and mullet. Merimbula Lake is the main mooring area for local charter and hire boats. 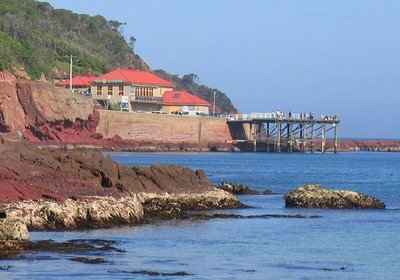 Merimbula Marina booking office is located at the end of the Merimbula Jetty, where half-day and full-day fishing trips can be booked. During the whale watching season between September-November, trips can be booked with local whale watch operator True Blue. Humpback whales with their calves frolic in and around close to the shores of Merimbula. 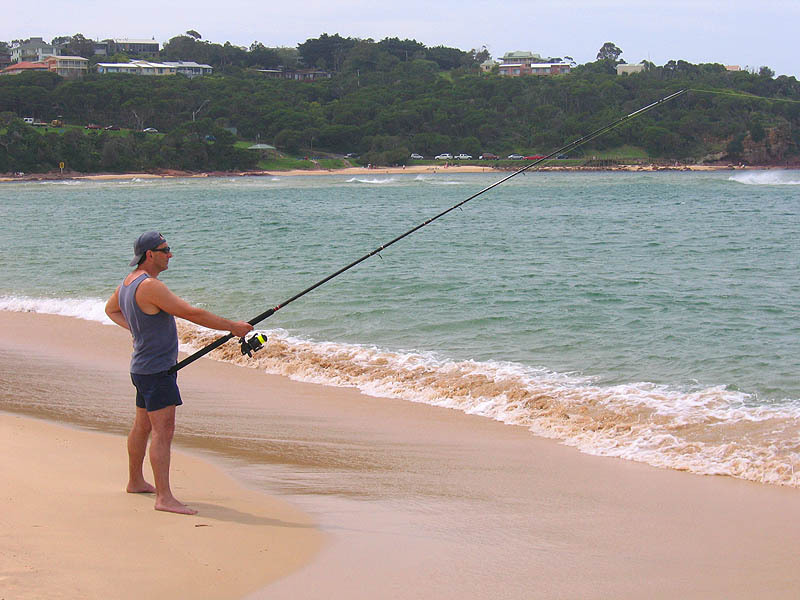 The Top Lake at Merimbula is another first-class location for fishing, whether it be from a small boat or land based. 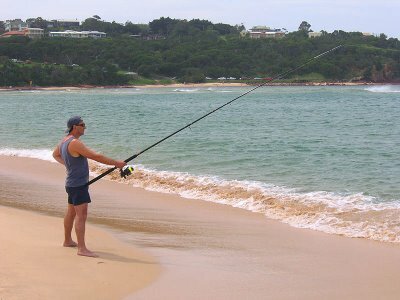 The lake has an abundance of fish which include flathead, tailor, bream, trevally and luderick. Prawns can be easily caught in the lake during the warmer months when the moon is "dark". For those looking for a scenic flat walk, there's a 3km boardwalk around the edge of the lake. The walk commences at the Merimbula Lake bridge and finishes at the Merimbula Top Lake Boat Hire. It's a delightful where you'll experience the sights and sounds of various species of birds. Information boards and seating are located along the boardwalk. 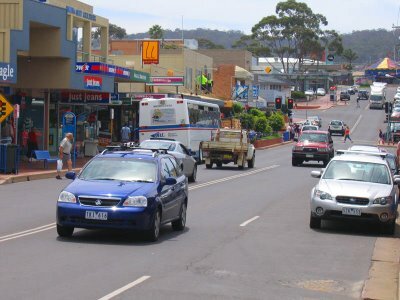 Market Street is the main thoroughfare through Merimbula. The Lakeview Hotel is located at No: 1 Market Street and is directly opposite the lake. The views from the bistro lounge overlooking the lake are superb, and when combined with a sumptuous meal of either steak, chicken or fish, you are guaranteed an eating experience to savour. 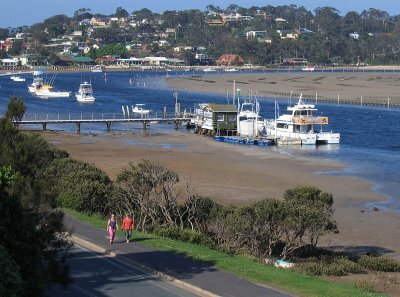 Merimbula - it's the Jewel Of The Sapphire Coast. This photograph was originally taken in colour and was substantially larger than the one you see here. 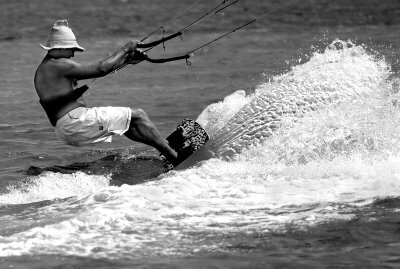 Some cropping and a conversion to black in white in Adobe Photoshop Elements 4.0 has led to what is a far stronger image with added impact. Adjustments were also made to the contrast level and some dodging and burning was performed to the shot. Manipulating and enhancing photographs is very popular with most digital photographers these days and it's a new skill I'm learning on a continual basis. I suppose most of us at one time or another have visited a community market but how many of us have actually set ourselves the task of photographing one? 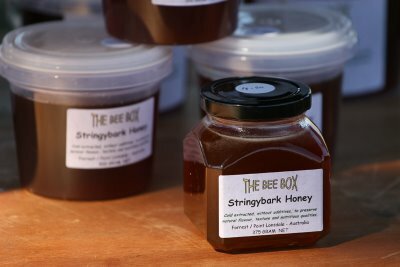 The coastal town of Apollo Bay, located on the world famous Great Ocean Road in Victoria, holds its local community market each Saturday between 9am-1pm on the foreshore. Having never attempted this previously, I set myself the challenge to photograph the market on Saturday 3rd March 2006. What was I going to photograph? 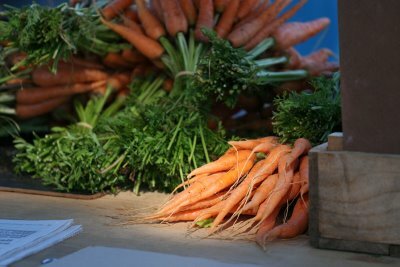 The people, the produce, the craft, the art? I came to the realisation very quickly that the best images would more than likely be captured with my 70-200mm lens due to the contrasty light conditions. 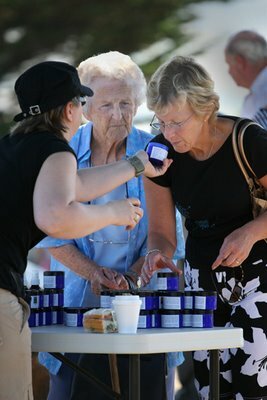 The market was a hive of activity from opening time with most buyers undoubtedly looking for bargains. The sellers displaying their goods were desperately keen to make a sale. There was a musician playing a flute, a photographer selling her images, a masseur providing a relaxing massage for a customer, kids drinking from the water fountain as many customers were browsing and leaving with their purchase. Ladies were the keenest shoppers with their senses being most attracted to the various creams and lotions on offer. Samples were being offered which in most cases lead to a sale. The vendor was smiling. The locally grown fresh fruit and vegetables were also in keen demand with buyers. 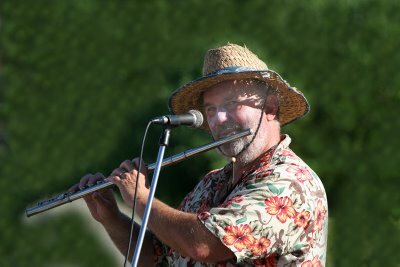 So, if you're ever in Apollo Bay on a Saturday morning and have your camera at the ready, visit the local community market and capture some images of a very popular attraction. Excellent accommodation can be found at the Best Western Apollo Bay Motel at No: 2 Moore Street Apollo Bay. Phone: 03 5237 7577. The Apollo Bay Hotel has a newly renovated bistro serving sumptuous meals at very reasonable prices. An extensive wine list, encompassing reds and whites, is displayed on a chalk board above the main bar area in the bistro . Copyright Darren Stones 2006-2013. Simple theme. Theme images by duncan1890. Powered by Blogger.